No PTO? 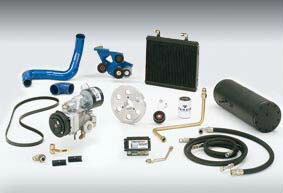 No problem with Vanair's Stealth70 Underhood Rotary Screw air compressor. The Vanair Stealth70 Underhood Air Compressor gives you continuous, on-demand air power at 70 cfm and up to 175 psi. The Stealth70's lightweight, compact design makes it suitable for all light to medium-duty trucks. Your single pickup can handle your toughest applications with improved mobility in traffic and on job sites, along with freed-up truck bed space to haul equipment.